US Coast Guard Air Station San Francisco is located just south of downtown San Francisco, California at the city's International Airport. 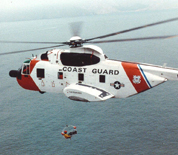 The air station conducts search and rescue, homeland security and environmental protection missions along California's coast from Point Conception to Fort Bragg. The primary aircraft flown at USCGAS San Francisco is the MH-65 Dolphin helicopter. This USCGAS San Francisco directory features the critical info you’ll need to navigate through the many facilities and recreational opportunities available on base.